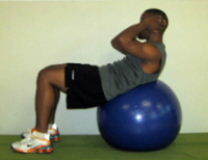 Over the past few years, nearly every personal trainer I have met recommends doing abdominal exercises on the ball. 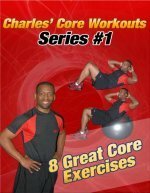 If you have read my page on the exercise ball, then you know that there are two main differences between crunches on the floor and crunches on the ball. lead to greater improvements in strength. Starting Position: Start by sitting on the ball. 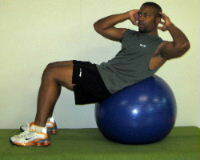 From the sitting position, walk your body forward until your hips are just off the ball and your back is over the ball. Keep your feet about shoulders width apart to help you maintain your balance, and place your hands behind your head. shoulder blades off the ball. lower back down to the starting position. 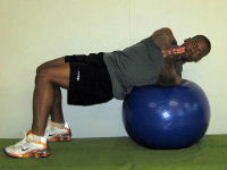 Personal Trainer Tips: Using the ball increases the range of motion and challenges balance. The more your hips are on the ball the more challenging the exercise. As you roll down further and take your hips off the ball, you decrease the range of motion. shoulder blades off the ball. As you get about halfway up, twist your body to one side. Hold for 1 second at the top, and as you uncurl and lower untwist your body before repeating the next rep going to the same side. 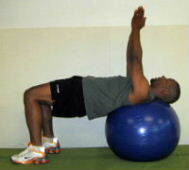 Personal Trainer Tips: Twisting increases the work on the oblique (side) muscles. You can perform this exercise by going to the same side 8-25 times and then switching sides. Or you can use an alternating fashion-- twisting left on rep and right on the next. Starting Position: Start by sitting on the ball, and walk your feet forward until your head and upper back are supported on the ball. Place your hands together, pointing towards the ceiling. Form: While keeping your hips relatively stationary, rotate your body to one side so that one shoulder lifts off the ball. Repeat on the other side. Personal Trainer Tips: This exercise requires good balance and good flexibility. The key is to move through your spine--focus on rotating your trunk not just your arms. These exercises are all great for getting you to feel more comfortable working your abs on the ball. Basic crunches are always the first ab exercise I teach my clients when I introduce the stability ball into their workout routines. There are so many different ab exercises that you can learn on the ball. 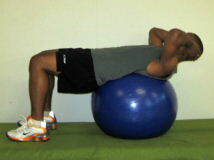 To learn a few advanced abdominal exercises on the ball simply click the link.